INTERIOR PEACE Zen Mind Living || "... Be The Change." The colors which surround us are an illusion created by our eyes and mind. Color, as we “see” it, does not exist on surfaces distinct from our physical body and spirit, such as in flowers, on leaves, or paint on the walls. "Color" is part of a continuum of energy which begins at the source of all light, then flows into the physical universe. Some of that energy is absorbed by various energy systems, resulting in a number of effects -- heat, photosynthesis and sunburn being three obvious examples. Energy not absorbed is reflected off the flower, butterfly or sparkling brook. This energy bathes our body, which reflects some (making us visible to others) and integrates some into our various energy systems, becoming part of us. That which enters our eyes integrates into the energy systems of the cells called "rods and cones", which are stimulated to release energy to our brains, etc. In our brain, certain patterns of energy fit into pre-existing systems, like a key into a lock, producing "color" and "vision". Our physical body is influenced by the energy level of the "colors" that surround us -- if harmonious with our energy, the effect is pleasing and beneficial. If unfamiliar, the effect can be extremely unpleasant, even dangerous. Every religious tradition recognizes that color enhances the flow of spiritual energy. Ancient beliefs hold that color and light strongly affect mood, spiritual conditions and physical health. Studies have confirmed many beliefs about color, and relationships have been shown to IQ in children, blood pressure, appetite and mood. Contents © 2005-2013 INTERIOR PEACE Zen Mind Living, All Rights Reserved. 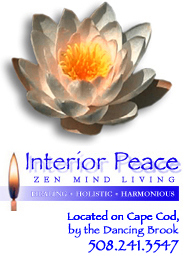 "HEALING LIGHT Color System" is a registered trademark of INTERIOR PEACE Zen Mind Living.